I posted this recipe early early on in my blogging life, and at the time I had a lot fewer readers. Three years later, I still consider this one of my primo recipes. Lately I’ve been swapping out ground lamb for the ground chuck, and I’ve made it in 2 cup ramekins so every guest gets their personal serving. MAKE THIS RECIPE. Now. With a green leafy salad, you’ll thank me. When most people think about safaris they likely envision exploring foreign lands in search of elusive, wild animals. 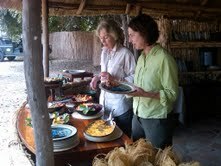 This was certainly an important part of the trip I took that included Kuyenda BushCamp in Zambia, Africa. However, much to the surprise of our safari hosts and cooks, I was equally interested in investigating the culinary aspects of this exotic place. I don’t think it’s every day that visitors sneak into the camp’s open-air “kitchens” asking questions about how to prepare local delicacies. 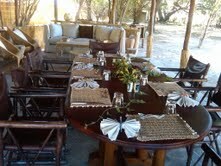 We arrived at this safari camp following a magical morning of viewing lions, elephants, wildebeest, giraffes and zebras. Our large army-green colored Land Rover came to a stop in the middle of a dusty plot of land in the middle of the African wilderness. The air was dry and hot and still and, once our driver turned off the engine, I was struck by the utter quiet. There wasn’t a commercial building in site and my husband and I felt blessedly sheltered from the tourist crowds. The most memorable part of that meal was a dish called Babotie (pronounced ba-boor-tea) an African dish originated by the Cape Malay people. This delicious, moussaka-like food is the national dish of South Africa and combines curried meat and fruit with an aromatic golden topping. I was immediately intrigued by the flavor profile so I wandered over to the cooking area to talk with the chefs. These were proud men who had likely been cooking for tourists for decades. They seemed a bit surprised by my inquiries but quickly became engaged in an animated discussion of spices and cooking techniques. I can still recall their lilting voices as they proudly explained the intricacies of preparing this exotic dish. When I returned home, I contacted Babette and she kindly sent me a recipe for Babotie. I immediately tried it out and, despite the fact that I did not have the luxury of cooking in the open air, surrounded by the sounds of wild animals, the dish turned out exactly as I remembered it. It has a long list of ingredients, but most everything was already in my kitchen. Every time I prepare Babotie for friends and family I feel like I am sharing a bit of my travels to South Luyenga State Park, and I am immediately reminded of the friends I made in Kuyenda. Heat the oil in a large sauté pan over medium-low heat. Add the onions and cook until soft, about 5 minutes. Mix in all the dry spices and cook 2-3 minutes. Add the meat and cook until brown, approximately 8-10 minutes. Remove from the heat and fold in chopped tomatoes, raisins, dried apricots, chutney, ketchup/chili sauce, vinegar, Worcestershire sauce and hot sauce. Return to the heat, bring to the boil, then gently simmer 2-3 minutes. Meanwhile soak the bread cubes in the milk for approximately 5 minutes. Squeeze excess milk from the bread by pushing it through a strainer, reserving the milk and add bread to the meat mixture. Add cream to the reserved milk so you have a total of ½ cup. Cook the mixture until the excess liquid has evaporated, approximately 20-30 minutes. Transfer the mixture to an oiled oven-proof dish (9 x 13 oval baking dish) and even out the top. In a bowl, beat together eggs and remaining milk and stir in a dash of cinnamon and a dash of vanilla. Pour the milk mixture over the mince so there is a thin layer of milk covering it. Decorate with bay leaves, and bake in the oven for 25-30 minutes or until custard is set. Bobotie is traditionally served with yellow rice which is made using turmeric. I serve it with brown rice and a very simple salad with a savory vinaigrette. This dish is even better reheated the following day. 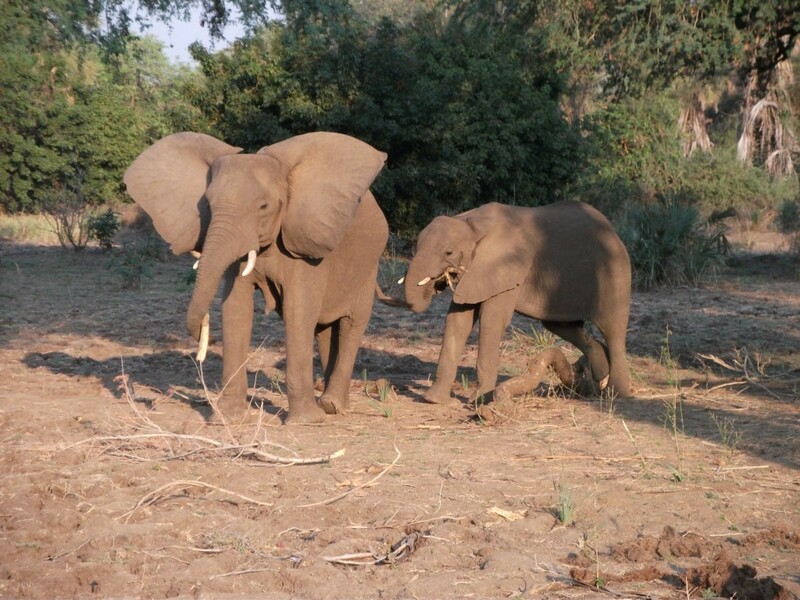 End notes: if you are interested in contacting Babette and learning more about the glorious bush camp in Zambia – you can contact her via Africa Calls or Kuyenda BushCamp. There are a number of wonderful cookbooks that feature authentic dishes from throughout Africa. One of my favorites are The African Kitchen by Josie Stow and Jan Baldwin. If you’re going on safari, I highly recommend you find two books by Trevor Carnaby. Beat Around the Bush – Birds and the similarly titled book on Mammals are chock full of easy explanations and beautiful photography. I found them to be indispensable! But buy them before you go – they’re twice as much in Africa. I like to use authentic serverware whenever possible. Some of my favorite silver pieces are made by Carrol Boyes and can be purchased online. This “Functional Art” is hand made by artisans in Cape Town, South Africa and features her signature figural style. Her trademark materials include pewter, aluminum and stainless steel. This entry was posted in Africa, Meat. Bookmark the permalink.